Even though I clean regularly and treat all of the rail on Thunder Mesa with NO-OX (see last month's video log), I still find it useful to treat trouble spots here and there with graphite in order to improve electrical conductivity. In the past I've used graphite sticks for this but personally find them to be a bit messy and inexact. My goal is to get the proper amount of graphite right on the railhead where it's needed, and not in the rail web, ties or ballast. 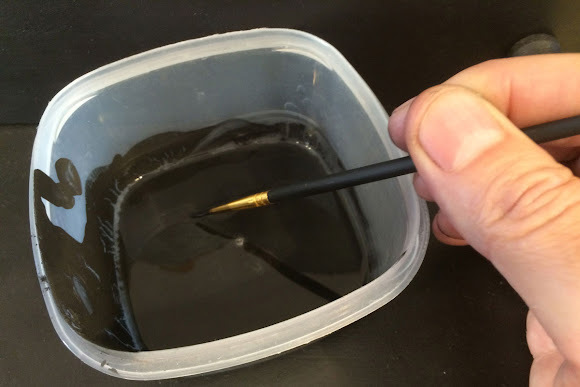 To that end, I've come up with an easy to make and use graphite solution that can be applied where needed with a paint brush. The solution is similar to the commercially available Neolube but is thinner, lasts a long time, and costs substantially less. 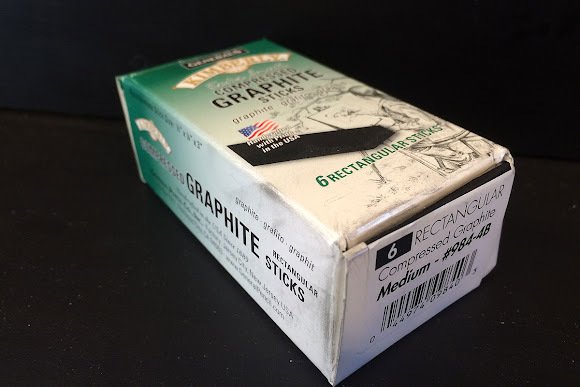 To make my graphite solution, I start with "Generals" compressed graphite sticks from my local art supplier. I like the soft 4B sticks since they contain more graphite and less clay than the harder sticks. The softer graphite is also easier to sand down into the fine powder required to make "paintable" graphite. I start by sanding down almost an entire stick with some fine 220 grit sandpaper, catching all of the graphite dust in a wide, flat-bottomed plastic container. 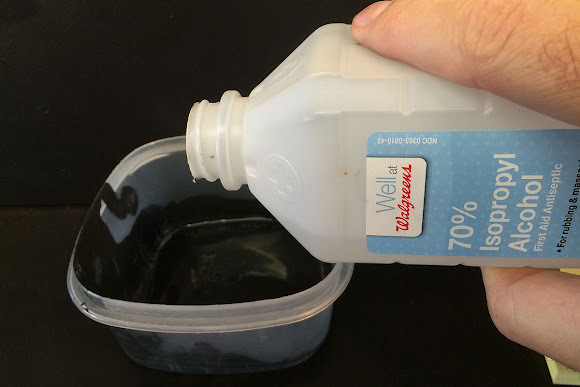 The next step is to add two or three tablespoons of 70% isopropyl alcohol. The amount is not critical, you just want enough to make a nice brush-able liquid without clumps. You're after a paint, not a paste. Mix well with a soft brush, then test the solution on some scrap paper. It should go on a transparent medium gray - not black. If it's too thick, add more alcohol. 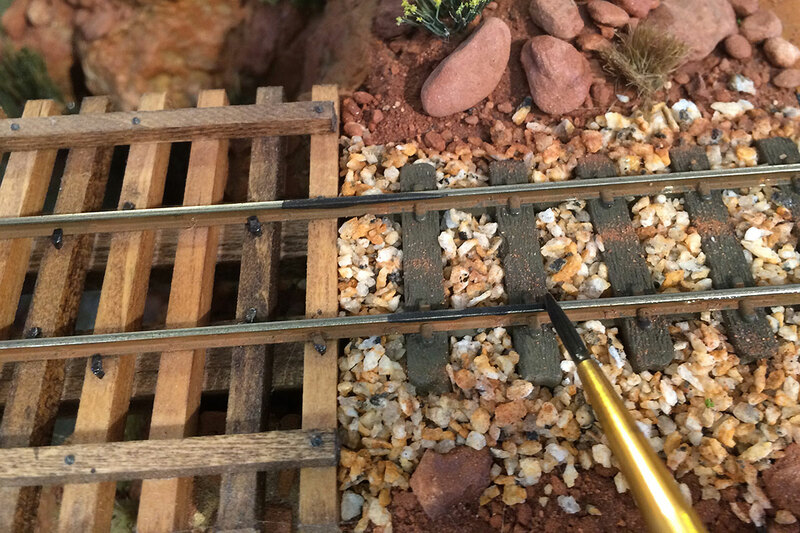 When the solution is ready, simply paint it on the rails in any trouble spots. It will go on very dark and then dry lighter. 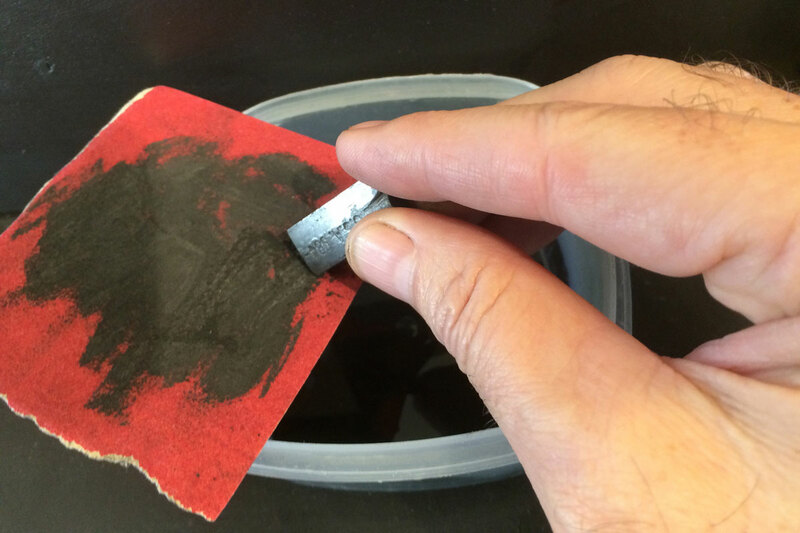 The alcohol will evaporate from the solution very quickly, leaving a thin layer of graphite on the railhead. Wait until it dries completely before running any trains over the area. You only want a very light layer of graphite on the rails. If it builds up too heavily, simply wipe the excess away with a cotton cloth. 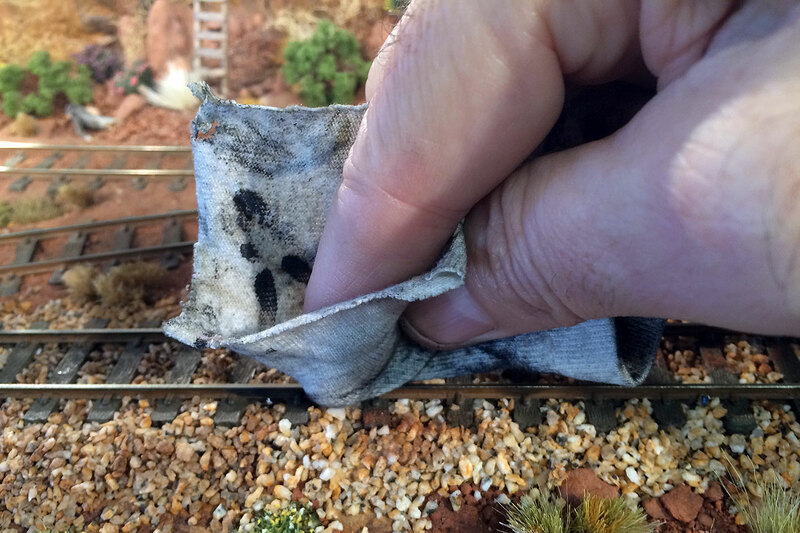 Once it is completely dry, run your trains over it and the graphite will be evenly distributed on wheels and track. 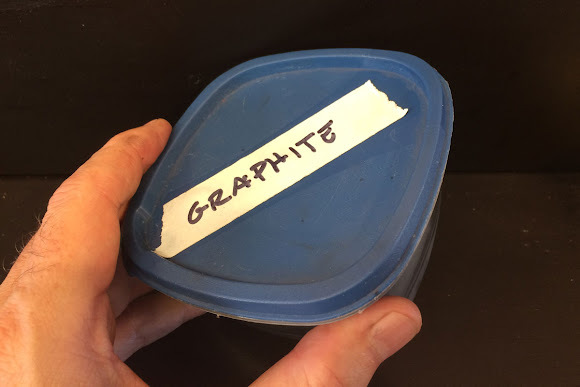 Sealed in its plastic container, one batch of graphite solution can last many, many months. If it dries out, simply add more alcohol to reactivate. I'm very pleased with my graphite solution and enjoy how well my short-wheelbase locomotives operate on the layout after applying it. I find it to be particularly useful on turnouts where just a dab between stock rails and points can greatly improve their electrical performance. 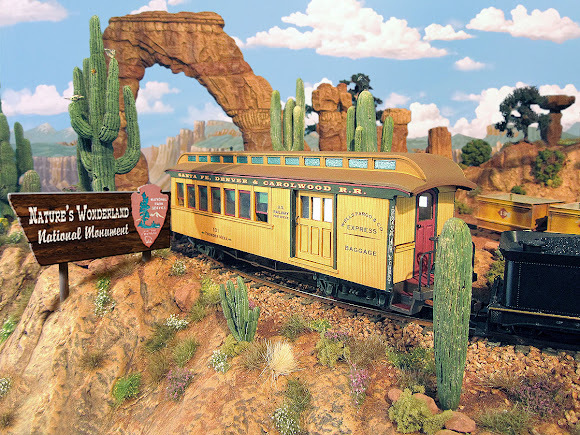 However, when I first posted this idea on one of the model railroad forums I frequent, I was immediately taken to task for "over-applying" graphite. Dire consequences would ensue, I was warned, if I continued down this dangerous path. There would be short circuits, arcing, loss of traction, and power jumps across gaps with this blasphemous liquid. I was even told that only invisible, microscopic amounts of graphite should ever be placed on the rails, as if it had some magical homeopathic quality that would be destroyed if it was ever used in detectable amounts. I'd like to see the data on that. I have never experienced any of the dire consequences warned about and have only enjoyed happy railroading. It is true that less is indeed more when it comes to graphite, but you do actually need to get some on the rails for it to do any good. What you don't want is a pasty build-up and that is very easy to avoid. Anyway, I hope that some others will give this solution a try. It works well for me. Thanks for checking in, amigos. Adios for now!